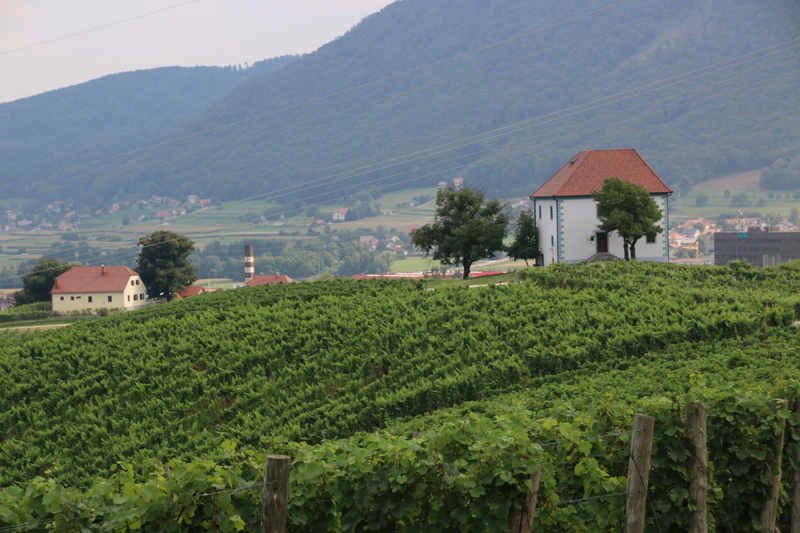 Last day up here in the mountains in the eastern part of Slovenia, where mountains and agriculture meet and hops and vines stand gloriously side by side, proudly extolling the quality of the other. So, if its beer or wine that floats your boat you will find excellent products of each for your delectation. Tomorrow it is back to Ljubljana for a few days before its back home on Tuesday. I am going to miss this place. I will miss the view every morning, now covered in distant haze as a storm builds. I am so familiar with it that I can lean out and reach through the murky horizon and caress those far, glorious lines in my mind. I will miss the cows , just a handful in each of two fields, and their relentless routine from pasture to shed and back again. I will miss the hoarse, screaming call off the two big boys (eagles, buzzards, kites, am not sure which) who appear every morning and rise the thermals and float off to a neighbouring valley to carry out their business out of sight but within sound. I will miss the handful of cars & clanking tractors who periodically negotiate the narrow lane around and down the head of the valley, disappearing into forest and reappearing at the same spot each time, a few hundred metres further on. Such repetition has set these sights in my mind so I can take them out and enjoy them whenever I please. 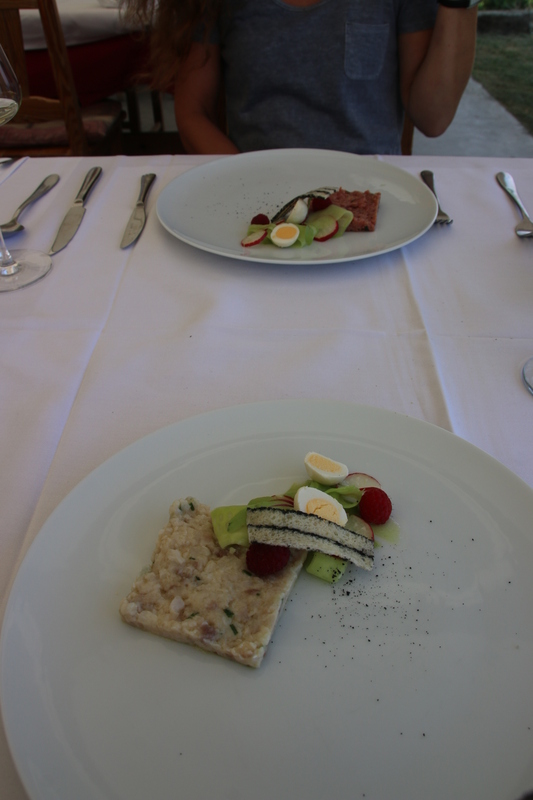 But one last pleasure is required before we got the bustle of the capital again – a special lunch at the Gric Restaurant I told you about a few days ago, in amongst the patterns of vines on the gentle slopes of Slovenske Konjice. 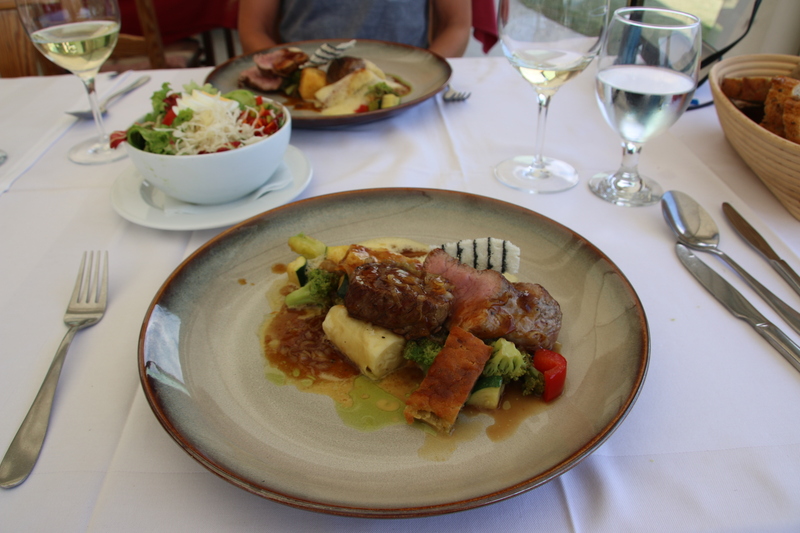 Veal, medium rare, with roasted veg, polenta cakes & cheese rolls, accompanied by a local Riesling. Chocolate souffle and coffee to finish. There is always one really special place to eat and remember.